Holy Cross Energy offers incentives to members who install qualifying renewable generation at their homes or businesses. Eligible systems include those using solar, hydro, biomass, geothermal or wind energy to generate electricity. We will allow consumers who install generators up to 500 kW for photovoltaic systems or 50 kW for other systems to net meter the generation against the electric consumption at the same meter. The following Generator Interconnect Policy shall apply to all generation resources including eligible renewable energy resources applying for connection to the Holy Cross Energy System. Holy Cross Energy strives to provide our members with safe, reliable and affordable power. As such we will continue to evaluate our policies and operations for efficiency, safety, and environmental improvements. Effective immediately all generator interconnect applications must include a fully detailed and complete system one-line and site plan depicting any existing on-site power sources, the proposed power source(s), and any disconnects or breakers between the source(s) and the Holy Cross transformer. Photographs of the existing meter along with exterior service panels and all other applicable equipment must be provided at the time of application. In the case of new construction, detailed descriptions of the proposed and approved equipment are required. A non-refundable interconnection study fee of $100 must accompany each interconnection application for systems with a nameplate capacity of 12-100 kW and $250 for systems with a nameplate capacity greater than 100 kW. The applicant may be responsible for additional study costs on a case by case basis, please review the information in Holy Cross’ Generator Interconnect Policy for additional information. Holy Cross will provide net metering service to consumers who install eligible generation behind their electric service meter. Under net metering, the meter will record net generation when the generator is producing more power than is being used on site and record net usage whenever consumption exceeds production. At the end of the billing month, Holy Cross will carry any excess generation forward to offset any net consumption on the next month’s bill. This will continue for 12 months, and any excess power delivered to Holy Cross will be purchased at the average cost of purchased power for the previous year as reported on Holy Cross’ year-end financial reporting, which will vary on annual basis. For residential consumers in 2018, the average effective rate for solar production is estimated at $0.108/kWh. This rate has increased 2.1% on average since 2005 as shown below. The average cost of purchased power for 2017 is $0.062/kWh, which is used to calculate true ups for any unused banked kWh during 2018. The difference between retail and wholesale power costs includes expenses associated with the distribution and transmission of electricity, operation and maintenance of the grid, and other utility operations. 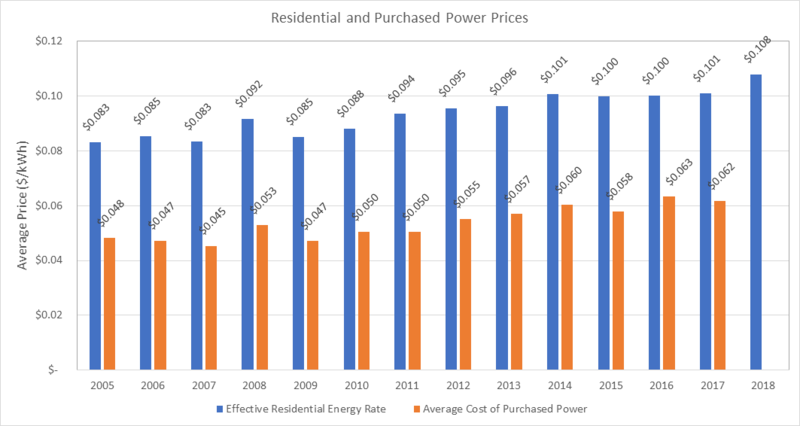 Note: Average effective rate = Tariffed Energy Charge, per kWh, for Residential service plus average Electric Cost Adjustment Rate Rider. Holy Cross will net meter photovoltaic generators up to 500 kW and other generators up to 50 kW. Generators must be designed to supply no more than 120% of the electrical consumption at a meter over the prior 12 billing months (at the time of application). If insufficient billing history exists, Holy Cross will estimate usage and specify a maximum allowable system size. See the Renewable Energy Net Metering Service – Optional tariff sheet for further details on Holy Cross’ net metering program. The following document explains how you receive credit on your bill for any renewable energy produced by an on-site generator. Line by line diagrams show detailed descriptions of how to understand your bill under different scenarios. This also includes a general description of all parts of the Holy Cross bill. All generators designed to operate in parallel with the Holy Cross distribution system for any length of time must provide a Generator Interconnection Application prior to beginning construction. A Holy Cross engineer review and approval is required for interconnection for all generators. Information on Holy Cross’ requirements and evaluation process can be found at our Generator Interconnect Policy page. Incentives are available to Holy Cross Energy consumers who install renewable generation for net metering at their premises. Current incentive levels are shown below. Incentives may be denied to consumers who proceed with installation of their systems prior to receiving written approval of a Generator Interconnection Application from Holy Cross as described above. Holy Cross will reserve incentives for 120 days starting on the day the Generator Interconnection Application is deemed complete. Any installations not completed (including all required documentation) before the reservation expires will lose their reservation. Any system that has forfeited their reservation may be eligible for an incentive payment based on the incentive program in effect at the time all requirements are met, subject to the availability of funds. Payment of any incentive is contingent on the assignment of all rights, title and interest in and associated with all RECs, green attributes or environmental offsets produced by the system, including the right to use all RECs for compliance with the Colorado Renewable Energy Standard. The following incentives are available for systems that meet all of Holy Cross’ program requirements on a first come, first-served basis. For non-taxable entities, Holy Cross will provide an incentive equal to 40% of the installed cost of a system (on a $ per KW basis) up to $1,500/kW for the first 25 kW installed at a site. Any eligible consumer must include documentation of their non-profit status at the time of application and directly own the generator. Any generator for which available federal tax credits are monetized is eligible for incentives under the tiered structure discussed above. For example, a 50 kW system owned by a non-taxable organization that cost $3,000/kW to install could expect a rebate of $30,000 (40% x $3,000/kW x 25 kW). Systems installed for compliance with local or county program or code requirements, such as REMP or Eco-Build, or owned by third parties and leased to the Holy Cross consumer of record are not eligible to receive an incentive payment under the above structures. However, Holy Cross will offer a REC purchase price of $150/kW for the first 25 kW installed at a site. Any generation installed in excess of the applicable requirement may be eligible for incentives, please contact Holy Cross for further information. Generation must be sized to supply no more than 120% of the account’s previous 12 months electrical consumption. For new construction, Holy Cross will estimate on-site electrical consumption and specify a maximum allowable system size. No member may receive more than $50,000 related to the ownership of renewable generation. Incentive payments will be reduced so that they do not exceed 40% of the installed cost of any project. No rebates will be paid for any generation capacity in excess of 25 kW per account, including ownership of community solar generation. No incentive will be paid without a detailed cost accounting of the system cost, including for leased systems. Holy Cross will not interconnect any system selling power to a consumer under a Power Purchase Agreement. Consumers must be in good standing on all electric accounts at the date of application and continue to remain in good standing through the date that the payment is issued to be eligible for incentive payments. Good standing means no more than two disqualifying marks (late payments, disconnect for non-pay, etc.) on any electric account in the previous 12 billing months. Consumers will lose their eligibility to receive any incentive payment if they fall out of good standing with Holy Cross. Consumer’s generation facilities must be connected to Holy Cross’s electric distribution system to qualify for incentives. Incentives for renewable generation are funded through the WE CARE rider on each Holy Cross consumer’s electric bill. Incentives will be funded at the current level unless a change in funding is announced. Holy Cross Energy provides safe, reliable, affordable and sustainable energy and services that improve the quality of life for our members and their communities.